The first official beta of Flock was launched last week and as it promised so much I gave it an extended test. Eight months ago I was pretty scathing about Flock. Not for me was the upshot of my brief trial. So why is it now so close to becoming my default browser? The browser has established itself as the most used app on a pc, for me at least. Get news, share opinions, shop, blog, download etc etc etc. No other app is used as much as the browser. So to move application it has to be as quick as the opposition, render pages accurately and also support easy migration from your old app. Flock is based on Mozilla (same code as Firefox) and I found the import of data to be excellent. Cookies and form data were imported as well as favourites although how the favourites were stored is another matter – more on that later. I thought the previous version of Flock was slow, not just in the application itself but also rendering web pages – not so this version. Almost all of the extra functionality worked well and was snappy in use. Web page rendering was fast and accurate. I also love the look of the app – more like a Mac than a Windows app although after using Vista there are some influences from there too. You can easily see when there is new photo or news content – a small orange circle shows you when your contacts or RSS feeds have been updated. Makes for an easier browsing experience. 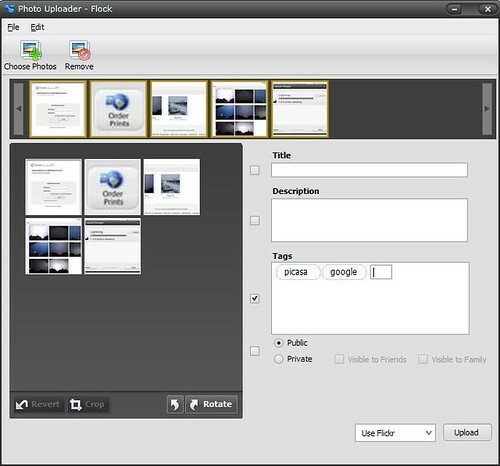 Flock integrates with Flickr and Photobucket via a Photo’s topbar. Once you allow the app to talk to your Flickr account it will check to see if your contacts have added any new photo’s and let you know when there are new ones to view. You can easily select your own photo’s or your contacts to be viewed in the topbar. Click on the photo to view it in the browser itself. You can also view your own, contacts or public photo’s by tag. The topbar totally changes how I use Flickr and now makes it easy to keep up to date with new content. If this wasn’t enough Flock also comes with it’s own uploader application to make publication to Flickr easy. Drag photo’s from any webpage to the topbar and it will launch the uploader app (which can be launched independently at any time). Using this app you can crop, rotate, resize images before uploading and create a new set, add to an existing set and then upload your images. You can also select files from your hard disk or just drag from explorer onto the app. Works really well and your newly uploaded images are instantly viewable in the topbar. More details after the jump. Flock has a fully featured news reader. Feeds can be added by clicking on the RSS feed icon in the address bar or by clicking on subscribe buttons on the web pages themselves. OPML import is supported so it took seconds to set-up my Bloglines feeds in Flock. 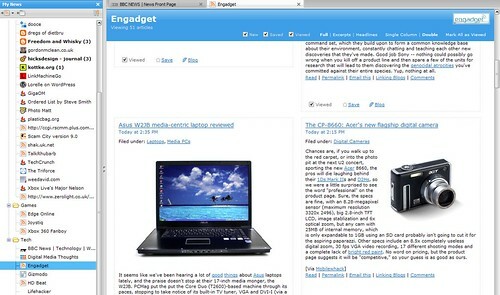 On launching the News window feeds are displayed on the left hand pane with articles viewed in the right hand side. Articles can be viewed as excerpts or in full and it is easy to toggle that you’ve read an article and also save an article for future reference. You can also blog the article your reading by using the in built blogging tool. Feeds are refreshed every hour which I find is enough – any faster and you’ll be constantly reading new articles and also stress the end users web server although the refresh rate can be changed. The one flaw is that I read my RSS feeds on multiple machines via Bloglines. If I use Flock and Bloglines I end up seeing the same articles. Flock’s news reader would be my number one choice on the PC if it integrated with Bloglines (or Google Reader for example) to mark off articles I’ve read. It’s being picky but when the whole point of Flock is sharing it’s an opportunity missed. 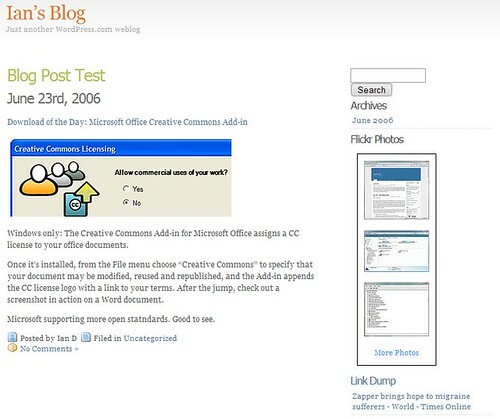 Flock supports posting to multiple blogs. 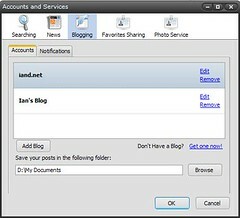 You can easily blog a Flickr photo, a snippet, content from RSS feeds or by selecting text and right clicking selecting ‘Blog This’. The blog editor is basic allowing for easy posting of simple content although you can swap to source view for some html hacking. Spell checking is built in and there is limited support for tagging posts. On publishing your post Flock will connect to your blog and retrieve available categories allowing you to select already existing ones (can’t add new) and then finally post you entry, loading your site once complete. The functionality is good for quick posting but most users will probably want to visit their site for most of their publishing needs – certainly tagging needs to be stronger before I would use it. Drafts are also stored on the local pc rather than as a draft post on your website which is quite limiting. The last of the major sharing aspects of Flock is favourites. You can share you favourites with del.icio.us or shadows which makes it easy to share links on multiple computers. Sounds great. You can also tag your favourites which allows for easy grouping and also explains why there is only one folder level within the favourites menu. Ouch. Importing the Firefox favourites was 100% successful except Flock puts all sub folders at the top level making finding favourites using my current storage method more difficult than with Firefox. Makes favourites quite clumsy but this has been acknowledged by the developers as one of the issues they need to address. Right click on favourite to open in new tab is another feature that needs addressing. However the sharing of favourites works really well and my previous concerns about privacy have gone as the favourite can be set to private or shared. There is also a favourites manager that can be loaded that allows for easy browsing and searching of favourites and history as well as the creaiton of new collections (folders). Just need to add the ability to nest them. I didn’t think there was much that Flock could add with regards search but I was wrong. As you type in the Search bar search results from Yahoo are returned in a drop down search results window. History and Favourtites (including tags) are also searched making it very easy to find a previously browsed page or favourite – makes up for the one level folder depth. Multiple search engines can be chosen and pressing return at the end of your search term will load the results from your selected search engine into the browser window. The searching is great – certainly the best I’ve seen in any browser. 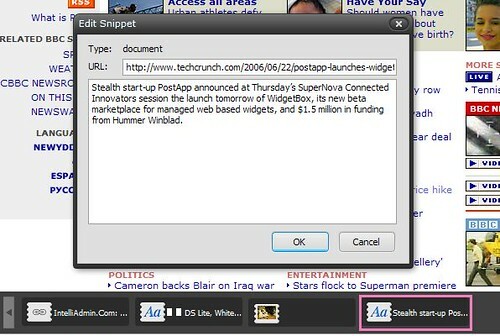 Snippets allow you to grab web pages, links, bits of text and store then within Flock for later use. Great for research and for storing up material for blog posts later in the day. A snippet can be images, swiped text, and just text that you’ve typed in. No difference to Google Notebook really but handy to have it integrated in the browser although like everything in Flock it would be nicer to see it integrate with an online service so that the snippets can be picked up on multiple machines and also that text and images can be stored as one snippet. Flock is all about sharing and for me it also makes tasks easier to do which is why we use computers in the first place. Flock’s set of features are an excellent match for the way I want to use the Web. Considering it’s a beta it’s stable and once the favourites management has been addressed it will be a superb browser. The Flock community is already growing with good forum support and a growing extension library. Download the beta and try it yourself – available for Windows, Mac and Linux. A full set of screen shots can be found in my Flock Flickr set. Not entirely convinced by Flock. Seems a little buggy, and slower than Safari, Camino and Firefox. It doesn’t intergrate with a Joomla embedded WordPress and I don’t use Flickr so it’s big selling points are diminished right there. I can see why it appeals to you though. I think I’ll stick with Firefox for now and revisit this at a later date to see if it’s browsing features (since the blogging and flickr features don’t help me) get bet as time goes on. Interesting concept all the same. At least you gave it a go – I know some people are reporting better speed on Mac than Firefox but I’m sure it will depend on ram and processor and how you work. Some folk like to have 20 tabs active at the one time…bit too much for my liking.